THE most famous stage star of the children of actor John Clyde was his daughter Jean, who spent some of her childhood and much of her later life in Helensburgh. From joining her brothers David and Andy on stage in childhood, she went on to become known all over Scotland, having appeared in many of her father’s productions, and later as the star of other plays. 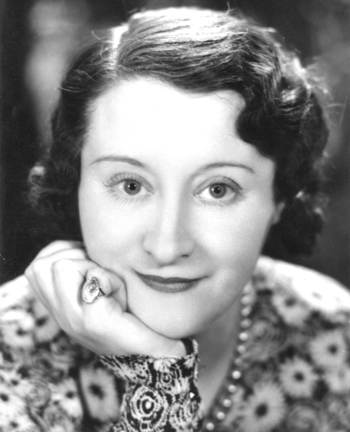 Jean, who specialised in Scottish parts and played many of the J.M.Barrie heroines, became a major stage star in England, Australia, South Africa, the United States and Canada. 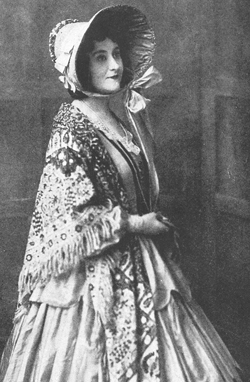 Born in Glasgow on March 17 1889 and registered as Jeanie, she started her stage career at the age of six months, when she was carried on as the child in Jeannie Deans during one of her father’s theatre tours of Scotland. Her first real tour was around Scottish towns with her father’s best known travelling play, Rob Roy. “Looking back on it, I wonder how I ever managed to do it. I was my father’s right-hand ‘man’ in those days,” she said. “Though I was much younger than my brothers, my father seemingly thought I had a better business head, so I had to look after the management side of the show — supervised by father, of course. “I wasn’t old enough — maybe I wasn’t good enough — to play a part, but I went on and danced a Highland fling. Later she got a part in Bunty Pulls The Strings in a touring company when she was 19, and in due course appeared in London. She played Bunty over 1,000 times in London and the rest of Britain, and also starred in it in Africa, Australia and New Zealand. She married her leading man, David Urquhart, who was later to be lost at sea, at a registry office in Halifax, and they toured with Bunty for two years. She said: “At Christmas we had a week’s vacation, and I got the very first train I could for Scotland. We had then a home in Helensburgh, where my sisters had a confectionary business. I was terribly excited at the thought of seeing the family again, and I thought they would be very bucked at seeing me. “When I arrived there wasn’t a soul to meet me. I was amazed, for I had sent them a wire to tell them when I was coming. I hung about the station for a while, then I took a cab home. I rang the bell and my young sister Nell opened the door. She had obviously been cleaning the grate when I rang. In 1912 she wanted to go to America in a company performing a play called The Concealed Bed, but was not selected — although her brother Andy was. In May 1914 she and the Bunty company left for Australia and New Zealand, playing despite the start of World War One for 18 months. She was then part of the Bunty Trio with her husband and Abie Barker, and they toured for another 18 months, during which she heard that on December 11 1916 her brother Johnny — born in Glasgow on Boxing Day 1884, the oldest of the six children and a very promising comedian — was killed in action in France. Next came a year in Africa, and in October 1918 they sailed for New York, where they arrived just before the Armistice after a nightmare journey. She made her first appearance on the American stage at very short notice in Philadelphia, and the management were so grateful that they insisted she had a holiday back home in Scotland before returning to New York to play in Scandal. In the spring of 1920 she came home again because of her father’s poor health. She and other members of the family nursed him in Helensburgh for three months before he died on November 1 1920. Theatrical tours followed, and in the spring of 1924 she made her first appearance on the London stage at the Garrick Theatre, once more in Bunty. Her brother David was a member of the Garrick company. In 1925 she was playing in the King's Theatre in Glasgow. More tours followed, until the early summer of 1927 when she decided to retire from the stage to concentrate on short story writing with which she had achieved some success. But seeing a play called Marigold, by L.Allen Harker and F.R.Pryor, lured her back to the stage in the role of Mrs Pringle (she is pictured left in costume), and she opened at Bradford in September 1927 in the first of over 1000 appearances in the part. A review of Marigold in a Liverpool paper said: “The first two acts are terribly slow, but they were made more than tolerable by the presence of Miss Jean Clyde, an actress who will send many an exiled Scotsman into Lime-Street Station to look up the next excursion north. Three years later the company took the play to Canada, and then to New York. In America she also played in The Little Brother. In the company with her were Richard Dix, the cinema star, Tyrone Power and Walker Whiteside. She also played in Scandal, and, just before appearing in Marigold at the Forty-Ninth Street Theatre in Broadway, New York, on October 8 1930, she starred in Courting. Once again Marigold went on tour in America, then back to Canada where her brother David was part-owner of a theatre in Vancouver and was running a British repertory company successfully. At one stage she was in one theatre, David in another, and Andy in a film at the biggest cinema in the city. The tour finished in Halifax, Nova Scotia, but she and several of the cast stayed on to present plays over the Canadian winter. It was then she became a producer as well as an actress. In Halifax, Nova Scotia, she played in and produced Jean Steps Out at the Garrick Theatre with an English company. The local paper reported: “As Jean Grant, who turns from a strict observer of the rules of the Kirk, to a lassie who adopts the view that being too modest is no way to catch a man, Miss Clyde runs away with premier honors. “Here is a play that rests the burden of success or failure on the shoulders of one character, and that burden is decidedly not misplaced. 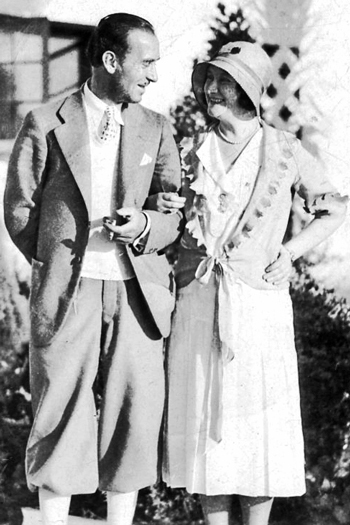 In August 1931, after a holiday with Andy in Hollywood (they were pictured together outside the Mac Sennett Studios), she began another British tour of Marigold. She took a young nephew from Helensburgh, Mac Watson, with her to several towns on this tour. Jean said: “I suppose we actors and actresses are looked on as a kind of race apart. Not so long ago we were simply described as rogues and vagabonds, and pretty well treated like such. We were undesirables. “Nowadays we aren’t quite so terrible as all that; people are beginning to realise that we are no worse — we don’t pretend to be any better — than the majority of other working folk. In 1934 in Hastings she married her second husband, Bill McQuaid, who worked for the Rank Organisation, and after his death on April 16 1949 she came home to Helensburgh where she lived until her death in Rhu on June 24 1962 at the age of 73. Lieutenant Commander Gill Aitkenhead MBE RN Rtd., who is a Deputy Lieutenant of Dunbartonshire, is Jean’s first cousin twice removed. She lives in Helensburgh, and remembers her Aunt Jean very well. Another relative living in the burgh is whisky executive Alistair Paton.